The Spanish football champions are the winners of the primary football competition in Spain, La Liga. The league is contested on a round robin basis and the championship awarded to the team that is top of the league at the end of the season. La Liga, first established in 1929, originally contained ten teams. 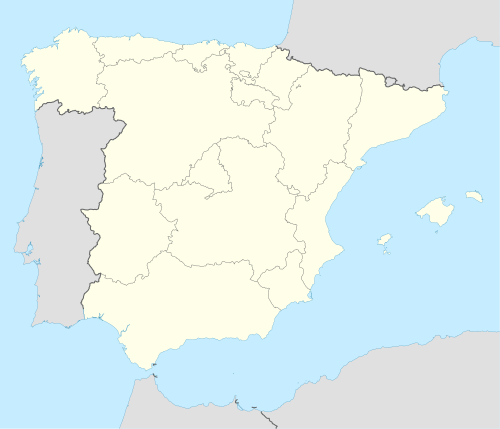 Before La Liga's organization, the Copa del Rey—a regionalised cup competition—was effectively the national championship. La Liga is contested in by 20 teams; the three lowest-placed teams are relegated to the Segunda División and replaced by the top three teams in that division. Of the founding teams in La Liga, only Athletic Bilbao, Barcelona and Real Madrid have not been relegated. The league was cancelled between 1936 and 1939 because of the Spanish Civil War. Real Madrid is the most successful club with 33 titles. The most recent club other than Real Madrid and Barcelona to win the league is Atlético Madrid in the 2013–14 season. With their 30 May Copa del Rey defeat of Athletic Bilbao, Barcelona has won the Spanish version of the double the most times, having won the league and cup in the same year eight times in its history, breaking its tie with Athletic's five. Barcelona is the only Spanish team that has won the treble, which includes the UEFA Champions League along with the league and Copa del Rey, and the only UEFA club to have won the treble twice after accomplishing that feat in 2015. The current champions are Barcelona, who won the 2017–18 competition. A. a Atlético Madrid were known as Atlético Aviación from 1939 until 1947. Cresswell, Peterjon; Simon Evans (1997). European Football, A Fan's Handbook. Rough Guides. ISBN 1-85828-256-X. ^ Cresswell. European Football, A Fan's Handbook. p. 489. ^ Hughes, Rob (8 April 2007). "Athletic Bilbao gets an Easter gift". The New York Times. Retrieved 4 December 2008. ^ a b "Spain - List of Champions". Rec.Sport.Soccer Statistics Foundation. 4 September 2008. Retrieved 29 November 2008. ^ "Doing the Double!". Rec.Sport.Soccer Statistics Foundation. 27 November 2008. Retrieved 29 November 2008. ^ Ashby, Kevin (27 May 2009). "Guardiola salutes his treble winners". Union of European Football Associations. Retrieved 28 May 2009. ^ a b "Spain , Final tables 1928–". Rec.Sport.Soccer Statistics Foundation. 28 September 2000. Retrieved 24 August 2009. ^ a b "Latest Spanish Primera Liga Table". Soccerbase. Archived from the original on 2009-05-14. Retrieved 29 August 2009. ^ a b c "Spain - List of topscorers". Rec.Sport.Soccer Statistics Foundation. 12 June 2009. Retrieved 29 August 2009. ^ "Laws of the game (Law 10)". Federation Internationale de Futbol Associacion. Archived from the original on 21 April 2008. Retrieved 29 April 2008. This page was last edited on 6 March 2019, at 11:51 (UTC).